1st Test, Galle International Stadium. Bangladesh have lost the 1st test against Sri Lanka by 259 runs at Galle. 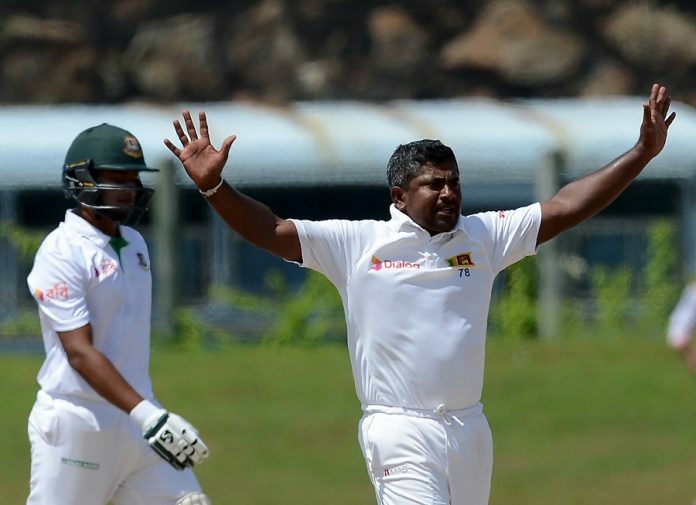 Rangana Herath lead the Sri Lankan attack with his 29th career 5 wicket haul and helped his side to achieve a comfortable victory. Bangladesh started the day with two unbeaten batsmen Tamim Iqbal and Soumya Sarkar. Asela Gunaratne picked up the wicket of Soumya in the second ball of the day. Dilruwan Perera dismissed Mominul Haque and Tamim Iqbal in quick succession. Then skipper Herath joined the party and started with two wickets in one over. Shakib Al Hasan and Mahmudullah were the victims. Mushfiqur Rahim and Liton Das passed the rest of the session without further trouble. Mushfiqur was gone for 34 after the first over of tea. Liton went for the flighted delivery by Herath, it got a leading edge. Upul Tharanga took an easy catch to dismiss on Liton 35. Tailenders were trying to put some fightback, but it was too difficult for them as Herath got rid of the last 3 wickets in no time. Earlier Sri Lanka posted 494 in the first innings. Kusal Mendis was the star batsman for the Lankans scoring 194 runs. Mehedi Hasan was the most successful bowler for Bangladesh with 4 wickets for 113 runs. In reply, Bangladesh were bowled out for 312 in the first innings. Mushfiqur Rahim played an gutsy innings of 85 which helped Bangladesh to avoid the follow on. Soumya Sarkar was the second highest scorer with 75 runs. Dilruwan Perera and Rangana Herath shared 3 wicket each. Sri Lanka declared their 2nd innings for 274 for 6 and set up a target of 456 runs for Bangladesh. Before the umpires called off the 4th day’s play due to bad light and rain, Bangladesh finished the day 63 without losing any wickets. 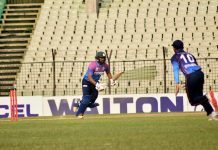 Soumya picked up his second fifty in the match from just 44 balls. Kusal Mendis is the man of the match for his fine hundred in the first innings. Second Test between Bangladesh and Sri Lanka will start on 15th march at Colombo P. Sara Oval Stadium.